The Ubuntu default desktop uses the Gnome window manager, which can be a difficult transition for Windows users. 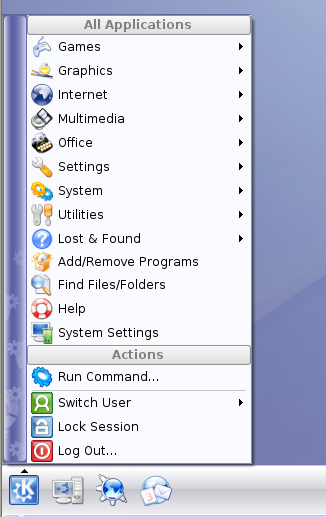 The KDE desktop would be a lot more familiar to Windows users, as KDE has something comparable to the start menu. If you’ve already installed Ubuntu, and you don’t want to completely reinstall with Kubuntu, you can just install the KDE window manager by installing the kubuntu-desktop package along with its dependencies. You will be prompted for your password, and then you will be prompted again asking if you really want to install. Hit the Y key to proceed, and let the install begin. Downloading all of the updates can take a while, so you might want to get a cup of coffee or something. 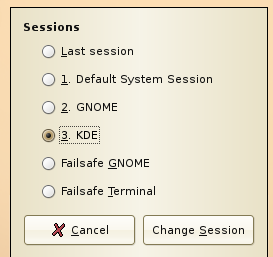 You will be prompted to select the login manager, which you can select as either gdm (ubuntu) or kdm (kde). I decided to leave the default gdm. You will be prompted to select the Session that you want. Here we will click KDE to continue. Note: If you are running Ubuntu inside VMware and end up with some really strange display issues where the display resolution is really huge but the desktop is showing up in 800×600 instead (see screenshot), there is a fix for this. When I experienced this problem, I was also unable to use the mouse. I rebooted, and logged back into the Ubuntu desktop instead of KDE, and went into the /etc/X11/ directory. You will probably see that your xorg.conf file was backed up to xorg.conf.1 during the KDE / Kubuntu installation. 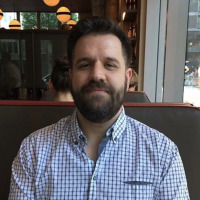 Just copy the xorg.conf.1 back to xorg.conf, reboot, and everything should be fine. Again, don’t mess with the xorg.conf file unless you are actually experiencing this problem.